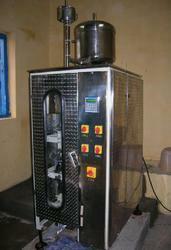 We are providing various kind of filling machine such as Jar filling , Pouch filling , Pet Jar filling etc. Jar Washing & Filling Machine find application in washing as well as the filling of jars and finds application in different production industries. Here, our expertise lies in making these available in different finish specifications so as to suit the functional demands of different industry sectors. 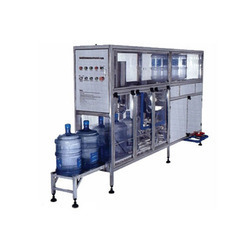 These machines provide functionality in washing and filling of jars and are used in water processing units. Made available in different operating specifications, these machines are used to fill water jars in different capacities. Further, these feature conveyor base operations and fully comply with involved filling-capping operations. 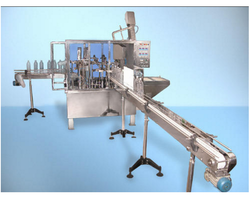 We manufacture and export auto bottle filling & capping machine. Auto Bottle Filling & Capping Machine is based on an automatic process that takes care of processes involving Bottle Filling, Capping. Coming with label shrink tunnels, these are suitable for bottles like sauce, beverage water, vinegar, rice wine as well as other liquids in film packages. 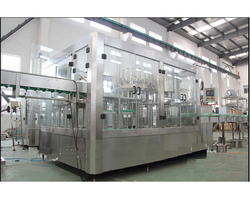 Pet Bottle Filling Machine is based on an automatic process that takes care of processes involving Pet Bottle Rinsing, Filling, Capping. Coming with label shrink tunnels, these are suitable for bottles like sauce, beverage water, vinegar, as well as other liquids in film packages. These machines also support the demands of applications involving plastic forming, UV bacteria killing, fixed quantity filling, date printing as well as automatic sealing and cutting. Further, the sealing temperature delivered is based on an automatic control that ensures a steady and beautiful packaging provided to the product. Pouch Filling Machine is available in options of quality material finish with superior tensile strength and performance support that make these machines highly demanded in the market. Finding application in meeting the packaging requirements of end products like water liquor, milk, oil, buttermilk, spice powders as well as other liquids in the free-flowing form, these are backed by latest technology support so as to provide for quality sealed packaging. Further, as these machines are mechanically operated, these require only power for handling the operation demands of gearbox motor as well as two heaters that find usage for sealing purposes. The quality heater support also helps in achieving perfect leak proof sealing as well as ensures avoidance of any leakages. Speed per min 30 Nos.